Woods Hole Oceanographic Institute (WHOI) successfully sends the hybrid ROV-AUV Nereus1 to the bottom of the Mariana Trench (6.78 miles; 10,911 meters)—samples seabed sediment and sends back some amazing pictures. 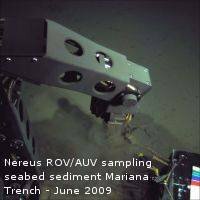 UPDATED 06/01/2012 ScienceNews, Defying Depth Nereus helping to study the creatures that naturally and routinely live at crushing depths. 1. Nereus in Greek Mythology is thought to be the son of Pontus (Sea) and is sometimes referred to as Old Man of the Sea. Together with Doris he fathered 50 sea nymphs referred to as Nereids. The mythical family lived in the Aegean Sea. Nereus was known to be truthful, righteous, gentle, and trustworthy—all this while raising 50 nymph daughters!